Today, with all the many combinations available, who doesn’t love a pizza! Green Lake, Wisconsin would be the ideal spot to celebrate. 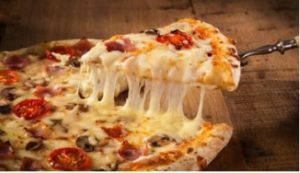 Some of our favorite places to get pizza include, Christiano’s Pizza, Vines & Rushes Winery, The Pizza Factory, Goose Blind Grill & Bar, Reilly’s Pub, Knuth’s Brewing Company and Road House Pizza. All of these restaurants have amazing pizza if you have not yet experienced. Green Lake, Wisconsin should be top on your list! While you are in town, trying to decide on which pizza you crave, plan some entertainment to go along with your visit. The Thrasher Opera House located in downtown Green Lake will be hosting Willy Porter on Friday, Saturday 9th. Please join them for a live guitar-driven performance. Top off your evening by staying at a premier Green Lake Bed and Breakfast. Stay with us at The Miller’s Daughter and be romanced by Green Lake. Our historic Bed and Breakfast Inn is situated in a peaceful setting surrounded by majestic pine trees with a serene and relaxing environment. Perfect way to unwind your evening. This premier Green Lake inn offers six comfortable guest rooms all with en suite bathrooms for your relaxation and privacy. They each have up to date amenities, flat screen TV’s, luxury linens and fresh decor that our guests are seeking. March 23, 2019 Thrasher Opera House Presents………..